The Frontier Gentleman was a superb western adventure series broadcast in 1958 on CBS. 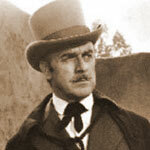 John Dehner starred as J. B. Kendall, a journalist for the London Times. Attracted to the frontier of the American West in mid-19th century, Kendall exiled himself to the chaos of the frontier in search for stories for the London Times. The show came on the air in the radio's fading years of the late 50s. But it stood out among many western shows that flooded the airwaves of the time. The existing 41 episodes were produced on tape, the superior audio of which added to its already high production quality. The program was produced and directed by Antony Ellis. The stories from the Frontier Gentleman are not only well-written and developed, but excellently acted and narrated. Notably, Kendall's deep and lonely voice greatly enriches the show's western ambiance. Each episode opens with its signature trumpet piece accompanied by the announcer Johnny Jacobs' introduction, "Herewith, an Englishman's account of life and death in the West . . ."
Roaming the frontier West, Kendall encounters drifters, outlaws, settlers, dreamers, as well as various legendary historical figures, such as Jesse James, Calamity Jane, and Wild Bill Hickok. One of the show's motifs is the cash-strapped Kendall anxiously waiting for the pay from the London Times.